Belts are one of those accessories that can instantly change the whole look of an outfit and vintage designer belts can bring your fashion game to a whole other level . Suddenly, what was once shapeless has definition, and what could have been a haphazard look is now a put-together look. Who doesn’t love that? We’ve all had those moments when we’re in the dressing room staring at ourselves in the mirror at the shift dress/loose pants/flowing top that spoke to us from the rack it was hanging on and think that something just doesn’t…look…right. And then it hits you—a belt! 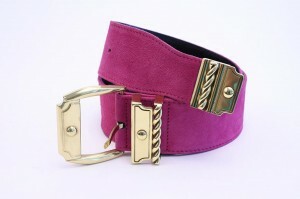 A perfect thin/wide/stretchy/metal belt in black/silver/gold/fuschia is what’s missing! Vintage belts are a great way to add shape to an outfit and can help to highlight a narrow point on your figure (pears, hourglasses, you know what I’m talking about here). They’re also an easy way to add a splash of color to your outfit (think our Gianni Versace pink suede belt paired with your favorite LBD). If you’re a Rice and Beans Vintage fan, you know we even love wearing metal belts as necklaces—I can’t even put into words how much I love the look of a metal Chanel charm belt worn as a necklace. Perfection! Here are some ways we love to wear belts: With a loose top and a tighter, more fitted bottom—wear the blouse tucked in on the front and sport a belt with a great buckle. 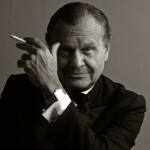 (Try the Vintage Chanel black silk blouse with a pair of jeans and the Vintage Pierre Cardin pale pink snakeskin belt—love.) This season the belt comes into play in a big way. 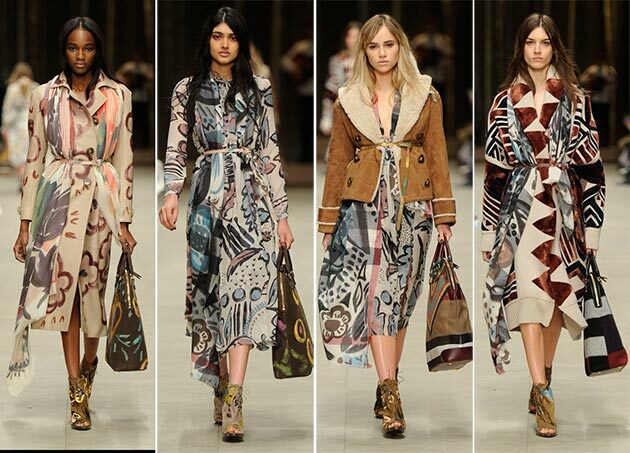 Blanket Dressing and blanket coats were a huge look on the runways for Fall/Winter. Burberry was the leader in the pack with Cara et al prancing down the runway wearing monogramed blankets that were you guessed it..belted. Belts are all about balance. Give definition to clothing without a defined waist—shifts, dresses, tunics, etc. As always, experimenting with fashion is fun—check out our selection of vintage belts and find your new favorite look! Vintage designer belts worn with Burberry dresses of today.